Time to suit up, gents! Well, at least try not to look like a total scrub. Here are all the tips and insights that helped me make the same effort while supporting myself in this substandard economy. "Proper Socks is the brainchild of Midwest-native Justin Schachner. As a management consultant in Washington, DC, Justin practically lives in his dress shoes and his socks are his way of interjecting person style into his business dress. Unfortunately, spending 12+ hours in unsupportive footwear took a toll on his feet. One night after a 10 hour work day, Justin traded his thin dress socks for a pair of his high-performance running socks to sooth his feet. Instantly feeling the difference, Justin began his search for dress socks with the same technology. After weeks of searching department stores and the Internet, Justin came up empty handed. With that, Proper Socks was born." It's become the classic genesis story of menswear start-ups today: unable to find the perfect product, resourceful entrepreneurs set out to make it themselves. And so far, Proper Socks seems to be doing quite well at it, with their early-bird $20 three-pack offering selling out in just hours. Lucky for you folks, other offerings are still available through their Kickstarter, starting at $29 for three. After a solid day wearing these bad boys, I'm pretty impressed. First off, the fabric itself is definitely an improvement from my pairs from stores like J.Crew, The Tie Bar or Gap. Where my other pairs are thin and often not very stretchy, these are soft, plush, and slightly but noticeably thicker than your standard dress sock. However, these aren't a hefty winter sock, by any means. In fact, their ventilated toe box is designed to keep your feet fresh and un-swampy through the day. I can't say I noticed the ventilation itself, but my feet have definitely not been roasting all day, as tends to happen when I wear my thick wool or ragg cotton pairs. Proper Socks kicks up the comfort level another notch by adding right-vs-left-specific arch support and targeted padding that provides extra cushioning specifically where your feet tend to take the most abuse. Again, I didn't necessarily feel the padding, but the arch support is definitely welcome, and after a full work day (and a lunch-break running around Chicago completing errands), I think I can safely say my feet feel somewhat less of the standard strain. As far as style goes, Proper Socks currently offers three different 'lines': the Washington in dots; the Brooklyn in stripes, and the Chi-Town in solid/color-blocked. The options are solid...stylish but subtle. Nothing crazy out-of-the-box, but there's definitely been much more attention paid to the aesthetics than your average performance socks. 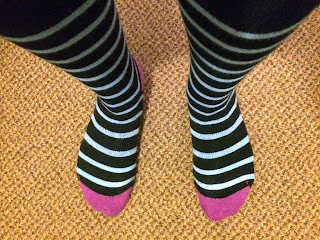 My pair is the pink/blue Brooklyn design, and I'm a big fan (I love stripes, I love blue, these will fit my wardrobe excellently). My only complaint is that the sock seems a tad big on first wear, and there is only one size offered. Honestly, the only reason I even noticed was the contrasting heel sits high, as you can see in the picture above. It's barely an issue at all, however, and I'm pretty sure a run through the dryer will fix it right up. All in all, it's a bit hard to judge socks after just a wear or two (definitely can't say anything at this point regarding durability, which can be a big factor). That said, these socks definitely have the potential to be big winners in my book. On top of that, $29 for three pairs is a pretty darn reasonable price, even for socks that do a helluva lot less for your feet. The final Wide Eyes, Tight Wallets judgment: I say go for it! Good price, comfortable socks, and a couple of every-day folks trying to make a positive impact on men's feet everywhere. What's not to like? 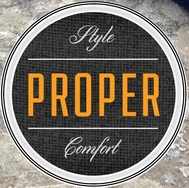 Contribute to the Proper Socks Kickstarter campaign and score some socks for yourself here! Do you have a product you'd like to see highlighted and reviewed here on Wide Eyes, Tight Wallets? Check out the submission guidelines here and shoot me an e-mail! This was a sponsored review, and the products reviewed were provided to me free of charge. 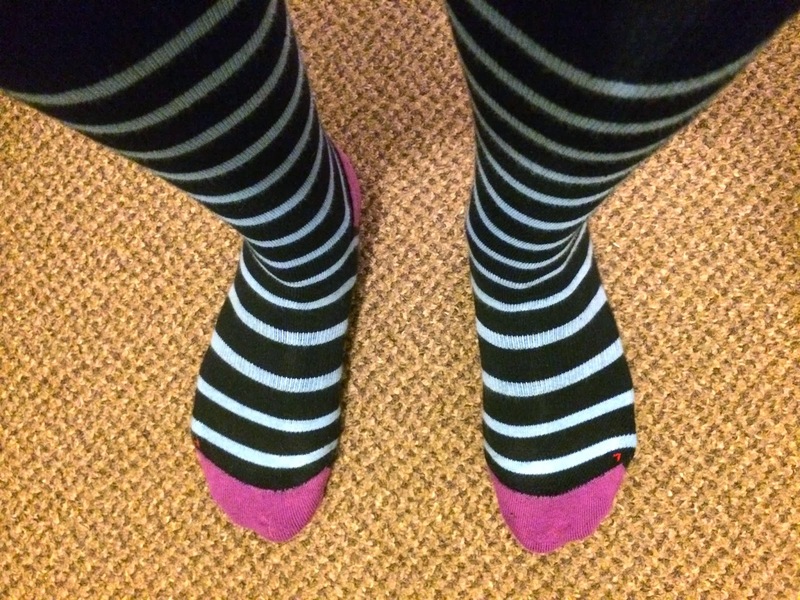 The article, however, remains objective and unbiased and is published without prior editing or review by Proper Socks. While I love to be given products to review, don't worry, I will never endorse a product I wouldn't wear myself. Do you have a product or brand you would like to see featured or reviewed? An idea for a post? Submit it to our Editors here. Have a special occasion on the way? Just trying to look good on a night out? In a style quandary? WideEyesTightWallets@gmail.com for tips, advice, or just a friendly ear! Get Your Eggnog Coat On! !